TGIF y’all!! I wanted to celebrate that we made it through the week by sharing a bit about one of my current projects! I started working with this client on their space several months ago (back when there was still snow on the ground). 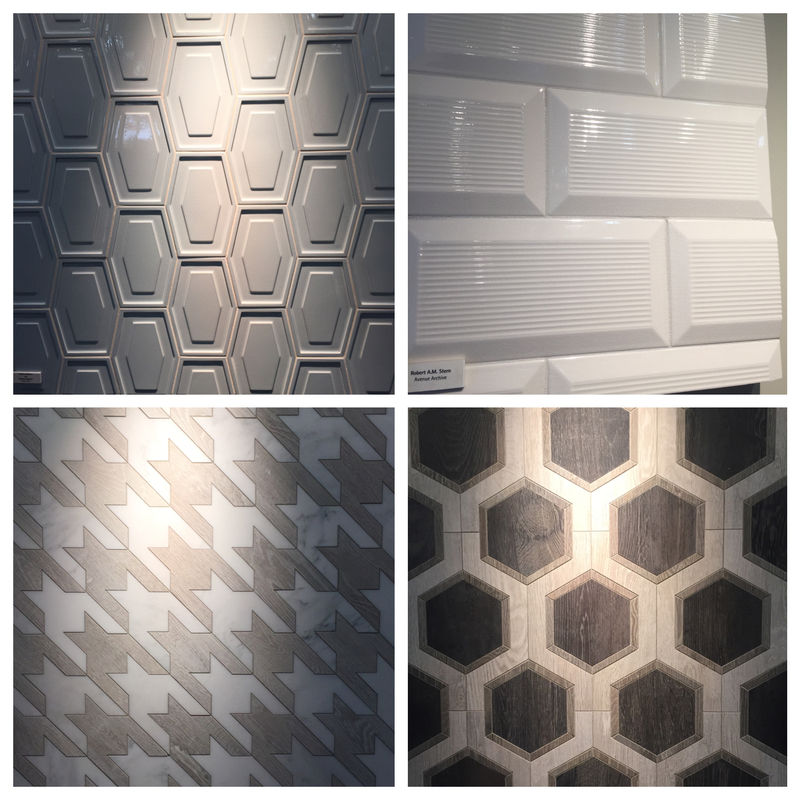 We sorted through all of the details of their space, worked out a plan, and started selecting our materials. Orders were placed around March or April and then we waited. This is not that uncommon in the world of renovations. You have to wait for your contractor to fit you into their schedule, the town to approve your permits, and the materials to all arrive. All that said, we were ready to go in June, but couldn’t start until a few weeks ago due to many variables. 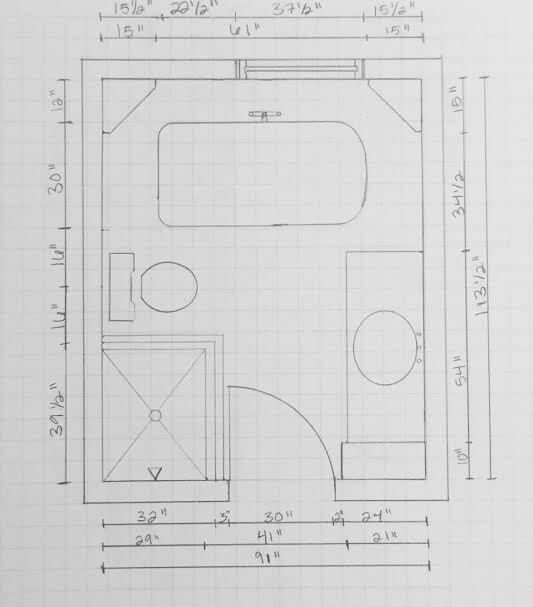 You can take a look at the planning process in this post (the first image shows me working through this space planning). And the plan above is the one that we ultimately went with. The idea was to bring in some more classic farmhouse elements to be true to the home’s character while not creating something that would easily feel dated. 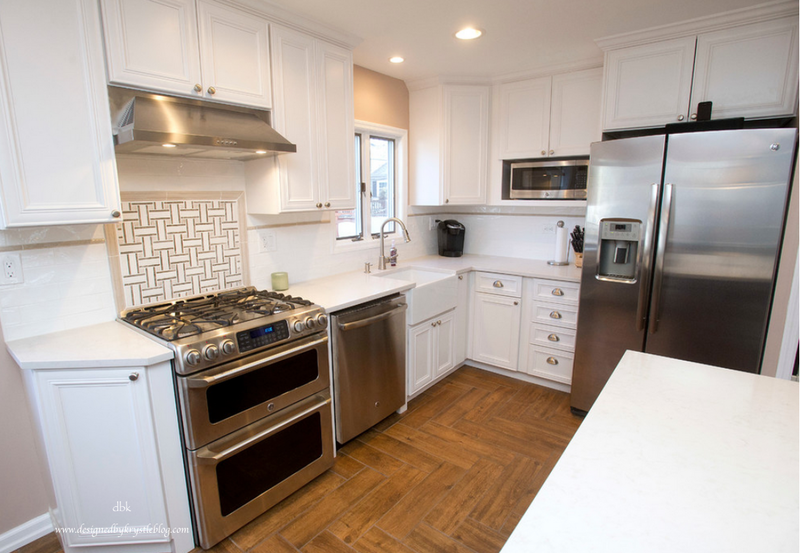 We decided to choose materials that represented that classic farmhouse feeling with the wood look tile on the main floor, white subway on the walls (in an updated scale and finish), and accents of Carrera marble in the counters, shower floor and saddle pieces. 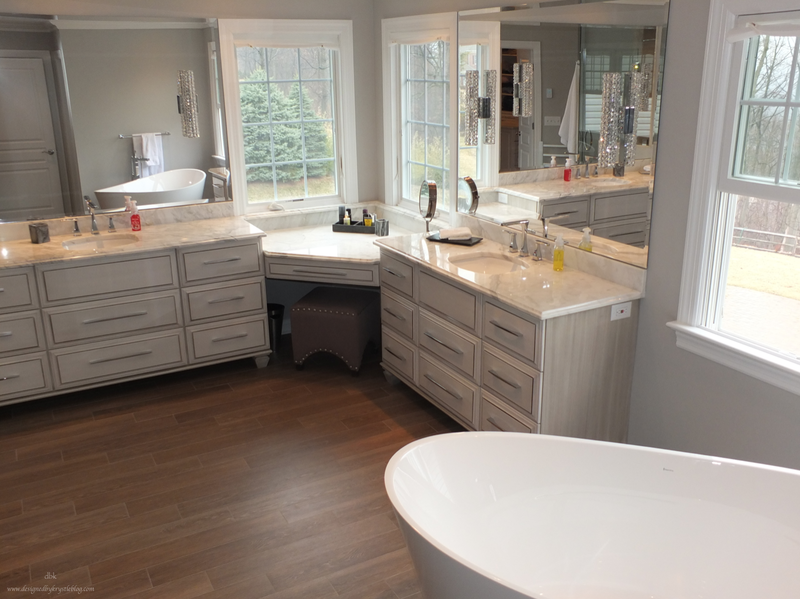 We went with a claw-foot tub centered in the bathroom space with a beautiful and classic tub filler to finish it off. 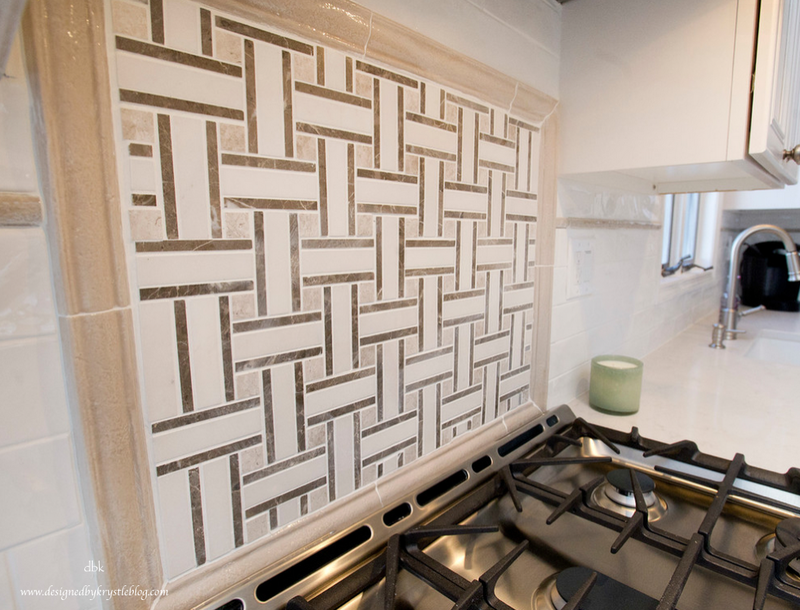 This detail was the one sticking point for this client, we had to find a way to make a claw-foot fit in the space in addition to the shower, and ideally make it stand out as a centerpiece. 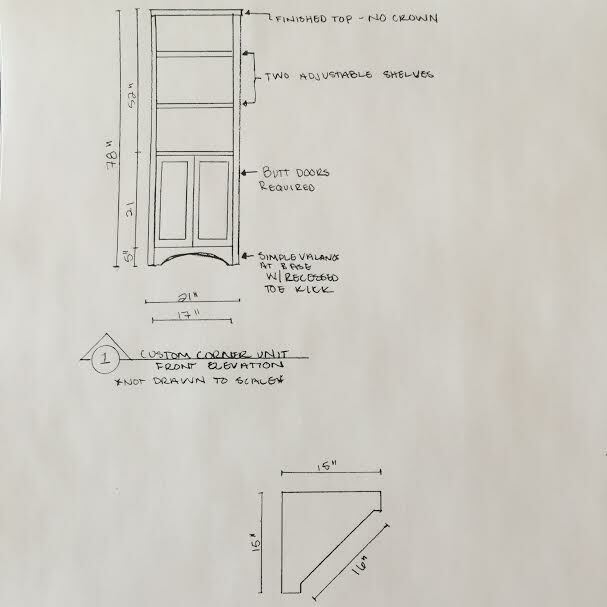 For the cabinetry, we went with a simple style and a classic valance base that nods towards an Amish farm style cabinetry detail. 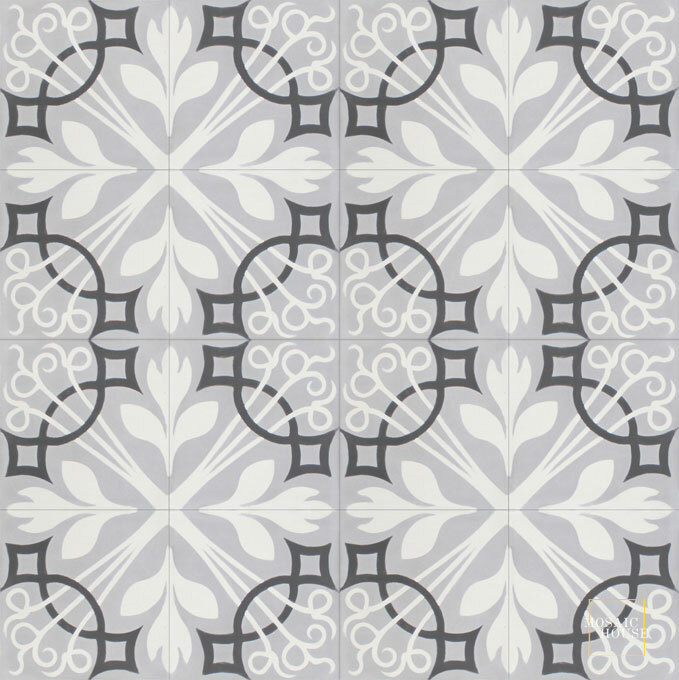 The plan is to carry this theme through with custom corner cabinets to flank the tub and add storage in the space (we had to knock out the linen closet in the hallway to make everything fit in the space that we wanted). 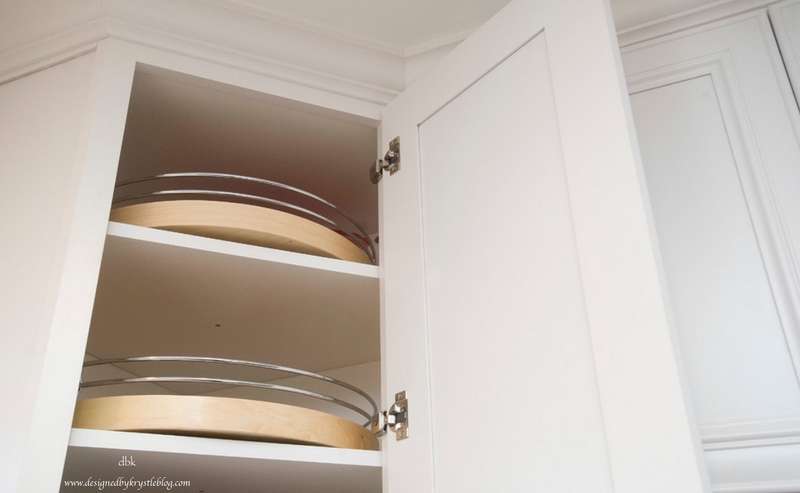 The corner cabinets would be a painted white finish with a valance base that would match that of the vanity cabinet, but for now they won’t be added due to budgeting restrictions (also very common in renovations), however they are all planned and ready to go whenever we are ready to add them. The vanity cabinet itself is a really pretty chestnut brown finish, which is a nice rich tone without the reddish undertones. I can’t wait to see how this whole space comes together! Hopefully I can share more soon! Are you working on any projects at home? 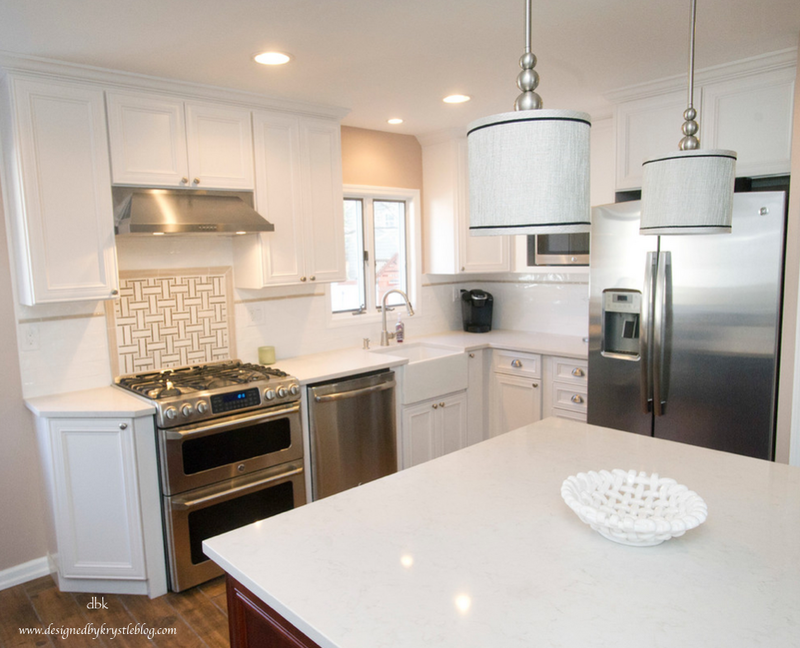 What renovations are on your list currently and what types of renovations do you want to see me share more of here? This project all started out with a little leak. The homeowner was experiencing a drip in their shower, which developed into mold, which spread through to their closet, and before you know it, their insurance was coming out to take a look at the problem. 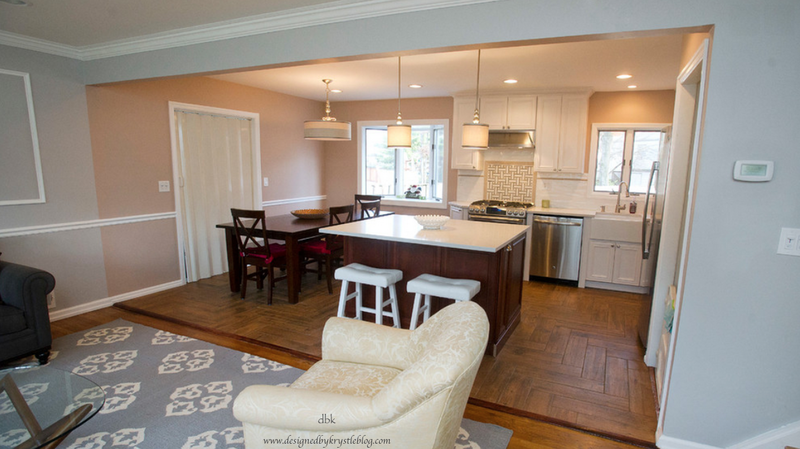 This project started as something done out of necessity, but soon became something that both husband and wife wanted to never have to worry about changing as long as they were in the home. So we worked through a more functional design for the space, shifting the walls slightly to accommodate a wider closet, swapping the tub location to accommodate the make-up area and more cabinetry. We shifted windows, added a laundry room, etc., When it was all said and done, it was so worth it. The only thing we did outside of the on-suite portion of their master was pick out new paint colors to help the spaces flow together better — hence the random photo of the fireplace. This is their sitting room that leads directly into the bathroom from their master bedroom. I could live in this master suite. All that is missing is a beverage center for coffee in the morning and wine at night, and a mini fridge and microwave for snacks. Maybe we can tack that on to their next home improvement project. When I first walked into this space, there was a wall facing the front door, concealing the kitchen space from the living space. 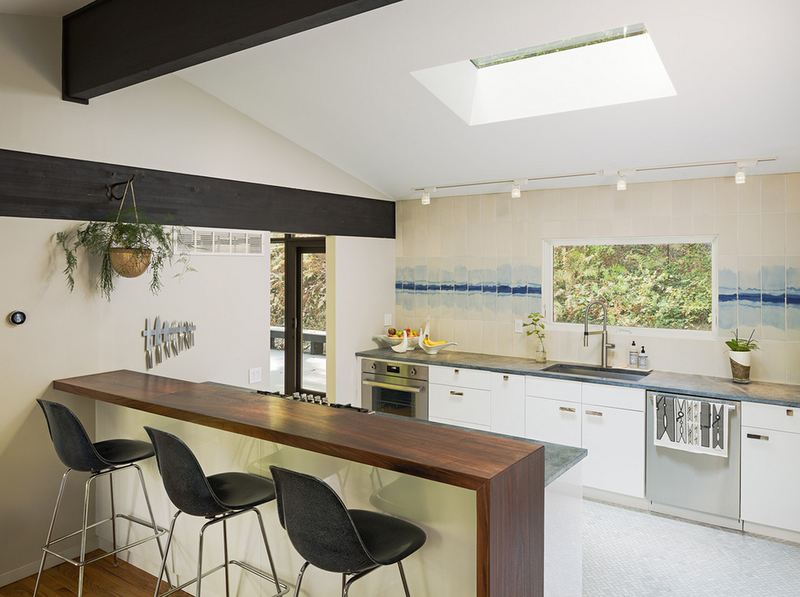 The plan was to open it up and achieve a better functioning kitchen space with ample storage and better sight lines through the main space. 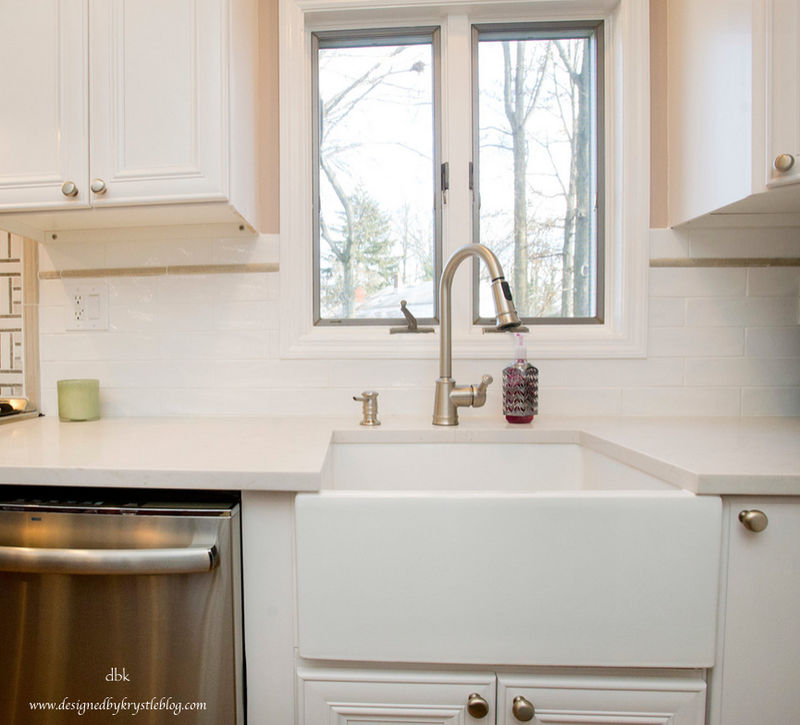 For a look at where this project started, hop over to their work-in-progress post here, and to see more images of this kitchen, hop over to our Houzz project page for this space here. 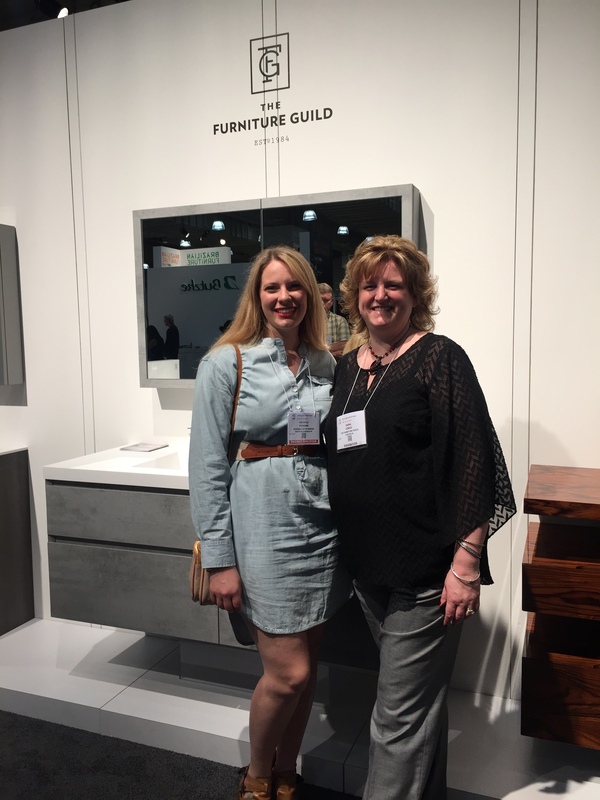 ICFF is an annual design trade show in NYC and I was so excited to be able to attend this year. I only went on one day but I covered as much land as I could while there, met a lot of people, found a lot of great pieces and felt very inspired by the time I left. So I wanted to share a few of the things I found with you! I didn’t take my good camera, only the cell phone, so please excuse the poor quality of the photos. 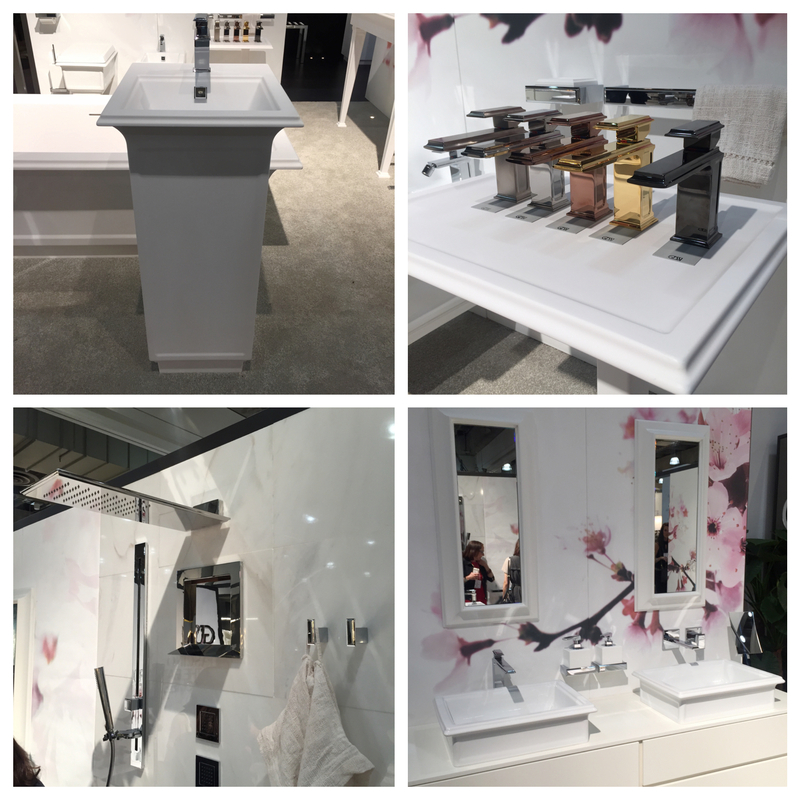 Fascino collection by Gessi is a stunning new collection that is complete from faucets to shower heads, sinks, tubs and even side tables. I loved seeing the different metal finishes in person! 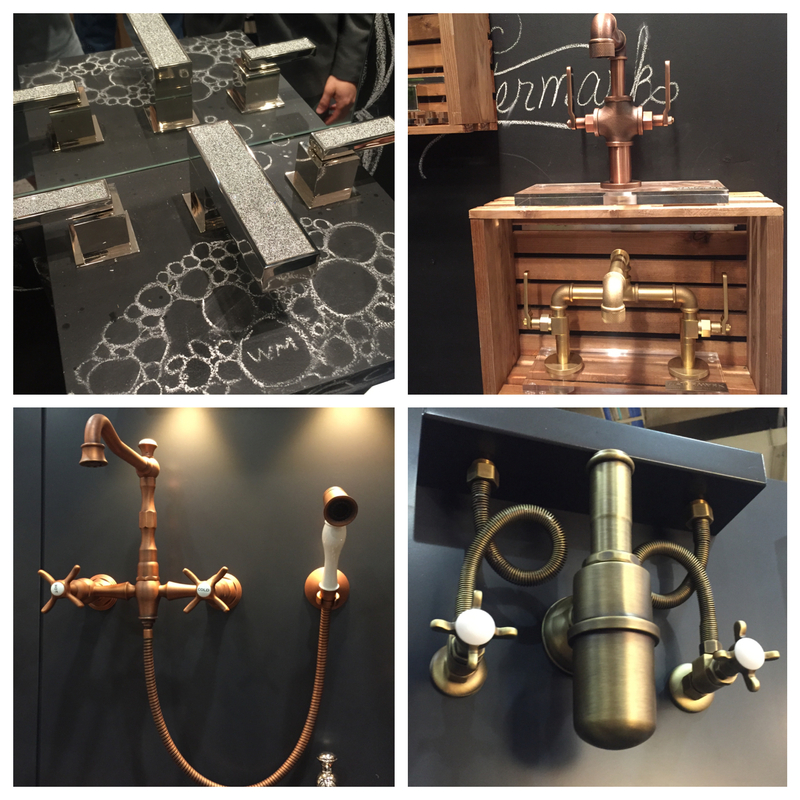 Faucetry: Top row, Watermark Designs based in Brooklyn, the faucet on the right is there new Elan Vital which you can create in countless forms and varriations; Bottom row, Rubinet which was displaying a whole range of unique colored finishes (not pictured) along with this beatiful copper and aged brass. I love that they include parts for the valves and exposed plumbing, an area that is often left to unattractive and standard finishes, when it’s exposed in a bathroom, it’s important to not leave this detail out! 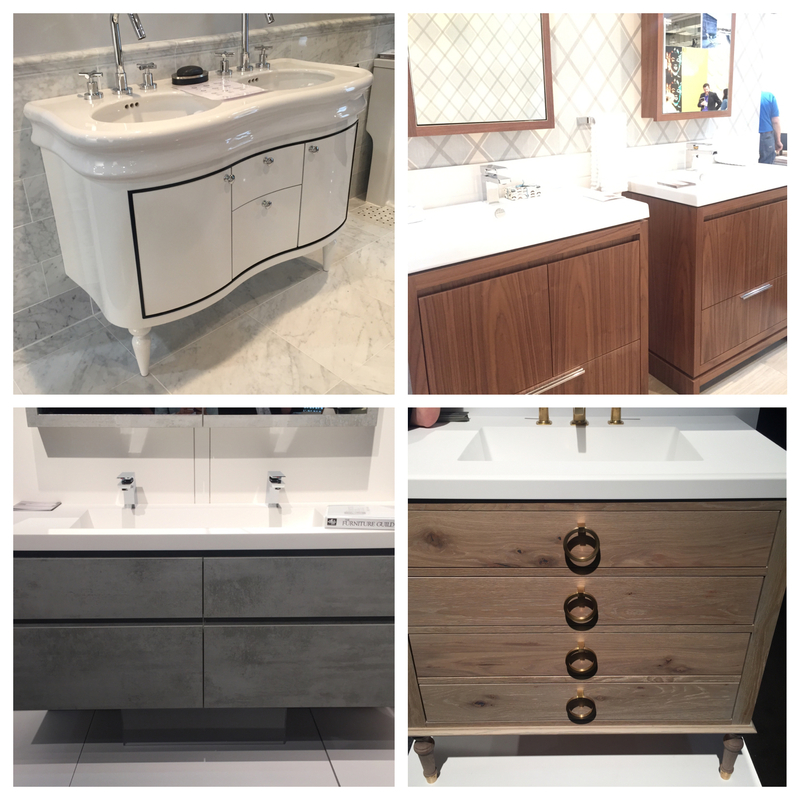 Vanities: Top row, Lacava– an Italian brand based in Chicago with beautiful modern pieces a full range of finishes and the ability to customize almost anything, though with this new collection we might not need to seek as many custom vanities. Bottom row, The Furniture Guild, featuring primarily their Nuvo collection. Based in Georgia, they are a great US made brand with amazing new technologies in there finishes ranging from textured laminate to acrylics and automotive finishes in addition to your standard wood and painted options, The Furniture Guild is also very customizable and Dana is my go-to gal for help in any customizing needed–I was thrilled to meet her in person! 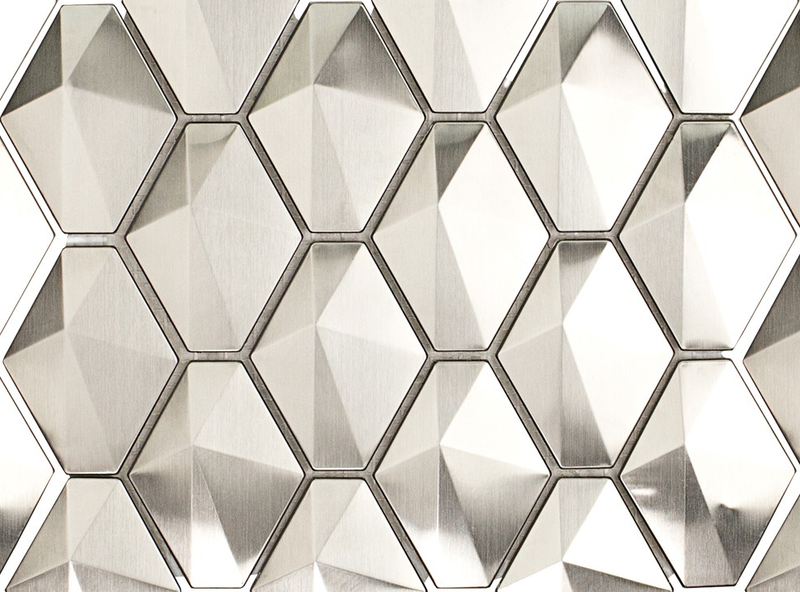 Tile: Walker Zanger, though I saw plenty of other incredible examples, I didn’t take photos of many other options and I also just love WZ and all of the stunning tiles they bring to the market. Lighting! If you have been around the blog for any length of time here you know I have a soft spot for lighting. I LOVED those two pieces on the top row, but unfortunately can’t find the name… I will add it later when I can access my literature from the show. 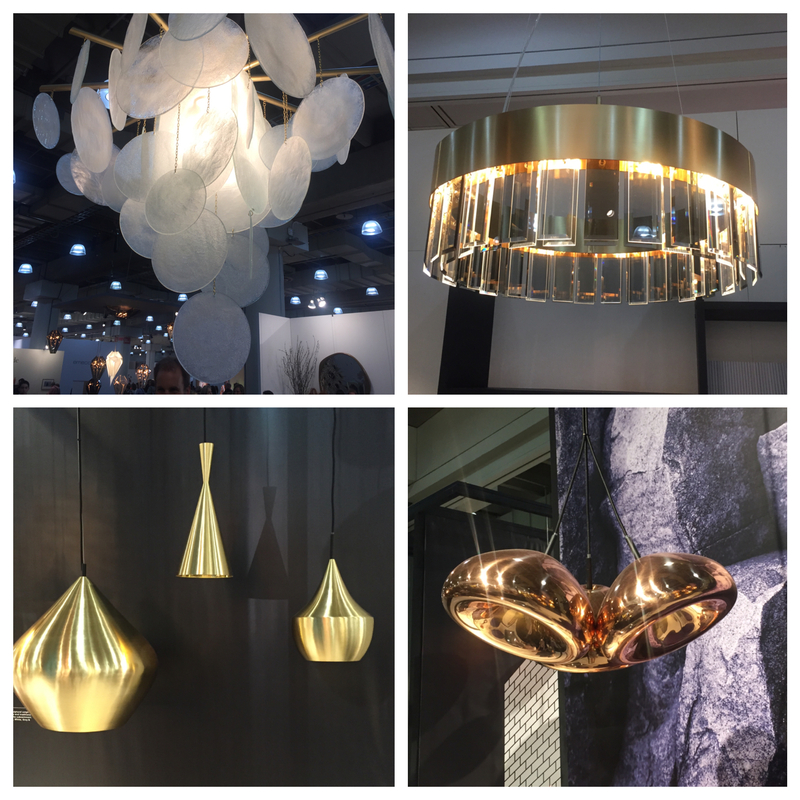 On the bottom row, those lovelies are by Tom Dixon, and he has a ton of other beautiful pieces, so if you are a lighting fan, check them out! As much as I saw and I liked, I only remembered to take pictures occasionally, so there is a lot not pictured! Next year I will try to remember to take more photos, but no promises!! Sometimes you can be so lost in the beauty of what you’re seeing that you can forget to stop and document it. I hope you feel inspired by some of what you I’ve shared, I know I’m feeling especially motivated to add little special touches to all of my current projects. 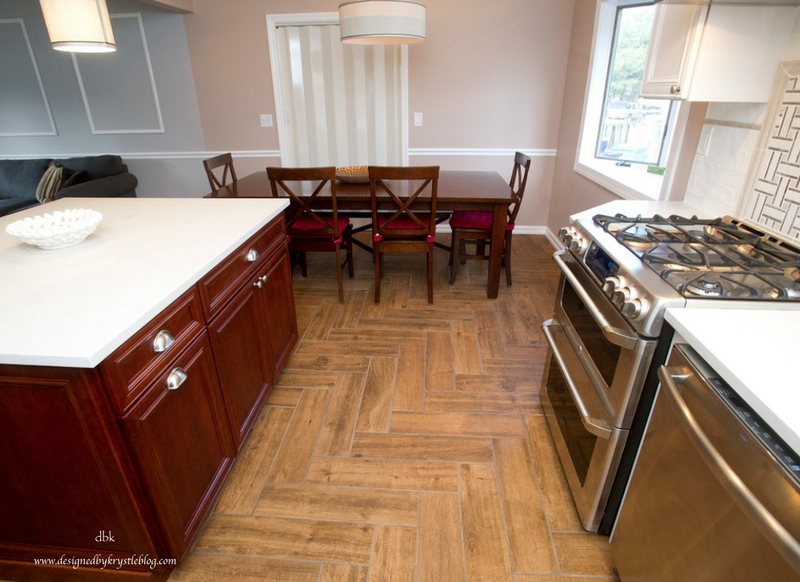 You might be asking yourself right now, “what is aging in place?” It is a big topic right now that is especially hitting home with many baby boomers, but is also relevant with anyone doing a renovation and considering how long the plan to be in any given place. As we get older, our bodies unfortunately begin to deteriorate. We find that it may not be as easy to get around and do the day to daily tasks we are accustomed to doing on our own. That is why this is such an important topic, because it isn’t something that only affects a select few individuals, it is something that will affect us all. The things you need can range from a bench in your shower because it’s easier to shave your legs, you’ve had a recent surgery and need to be careful about where the water is going, and how much standing you are doing, or that you are older and may need help bathing at some point — to adding grab bars. Although many of us don’t like to think about these things — because they are scary and we just aren’t there yet in our lives — they are a reality. People are living longer, and with that longer life come challenges. 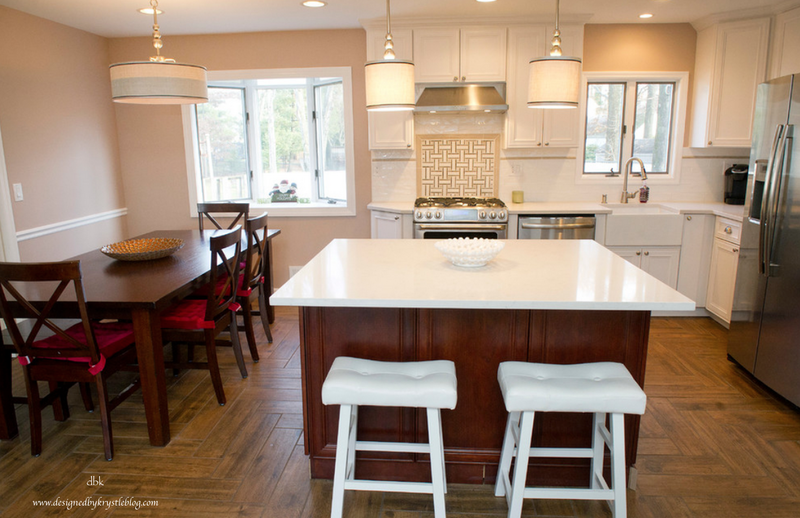 Instead of letting these things creep up and surprise us, why not plan for them in your renovation process? 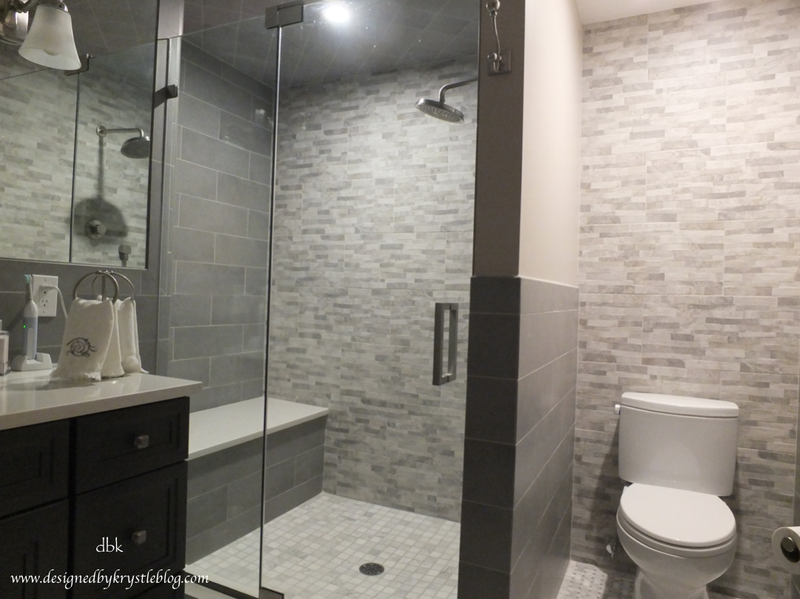 In a bathroom renovation, especially a first-floor master bath as is the case in this project, it’s a nice idea to offer some elements that will help give the space longevity and work with us as we age. These details can still be appealing and never have to look clinical with all of the pieces available in the world today. If you think you are going to be spending 20 years in your home, it is definitely worth weighing the options. 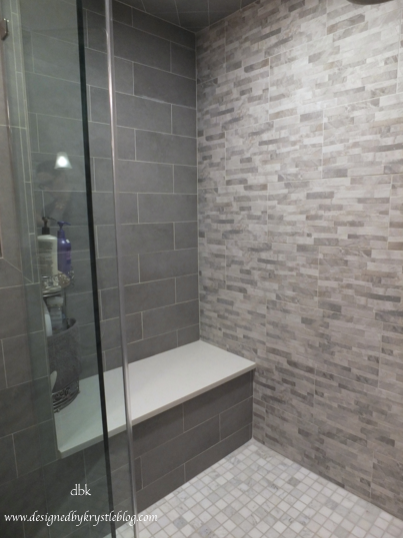 Some elements to consider are converting from a tub/shower combo to a shower only so you aren’t stepping over a large barrier while you are climbing in and out. If you are getting rid of that tub to make room for a larger shower, why not add a bench, you may be surprised at how much you like to have it, even before you need to use it! Grab bars are another thing that people don’t like to think about. When you see grab bars, they just feel old and clinical, but I’m telling you there are so many more attractive options out there these days that finding something that both looks nice, and serves a great purpose as well, is relatively easy. 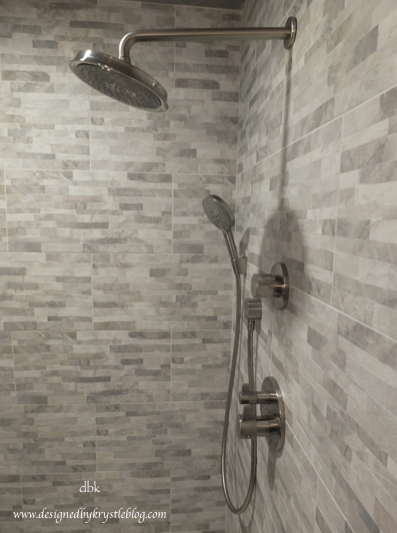 Consider getting a small (12″) grab bar and positioning it vertically inside the shower door to hold onto as you climb in and out (this works well if you keep the tub too); and a medium grab bar (18″+/-) placed horizontally along the back wall to stabilize yourself as you are showering, or to hold onto as you maneuver yourself to the bench. Consider adding a handheld-shower to your shower. If you have a bench, consider placing the handheld-shower near the bench, you can use it while you are young to shave your legs, and when you get older it will be positioned right were you need it. Hand showers also come in handy for cleaning the shower so that you don’t have to bucket the walls. (I could actually do a whole blog post on the conveniences of adding a handheld shower.) This particular unit is made by Hansgrohe called the “Select,” and it offers a button to help change the settings without having to rotate the whole face of the unit, making it much more user friendly for all ages. 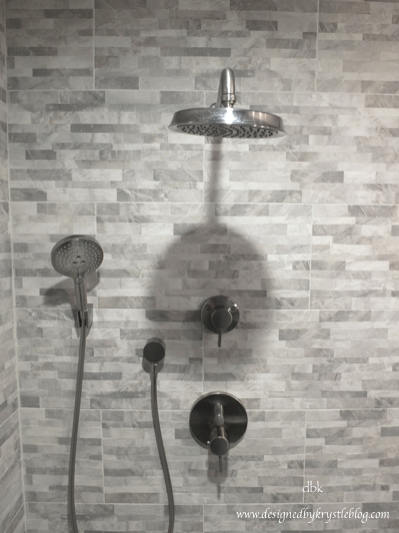 Finally, when you are selecting the controls in your shower, remember to touch and feel different styles. See what is easy to hold and turn now, and consider if something is more difficult now, how it may be come even more challenging as you age. 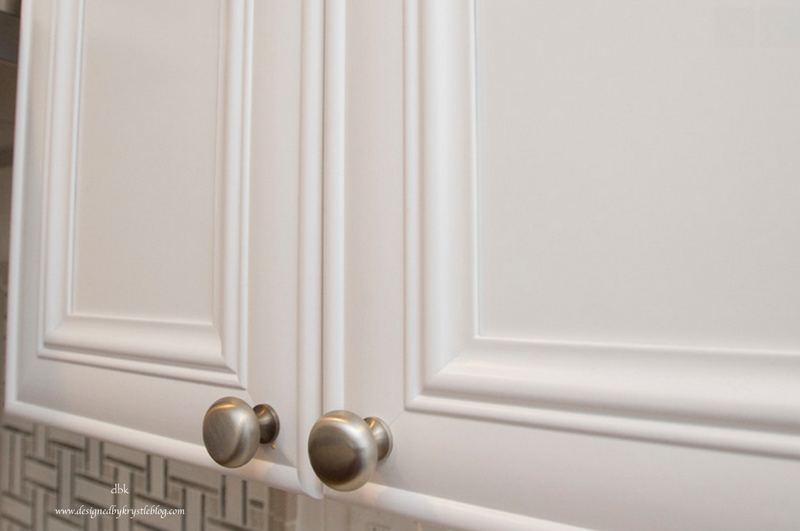 Everyone is a little bit different in what they prefer, but typically speaking, lever handles are easier to adjust quickly without having to really grip, where as a knob can become slippery and a cross handle can become challenging to really grab hold of. Some things to consider outside the shower are the vanity area and the toilet. Most toilets these days are “comfort height,” but it’s a good thing to double check when you are ordering, it will make a big difference as you are using the facilities. 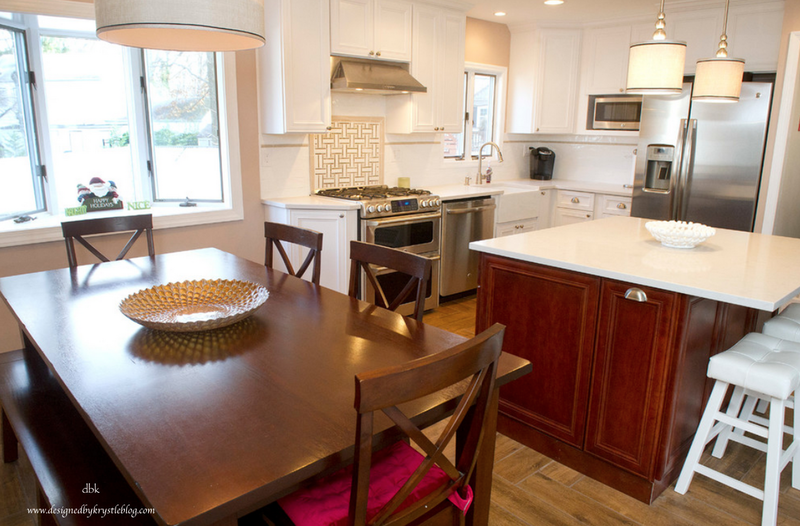 For your vanity, consider going with the newer kitchen height cabinets (which finish at 36″ with the top). 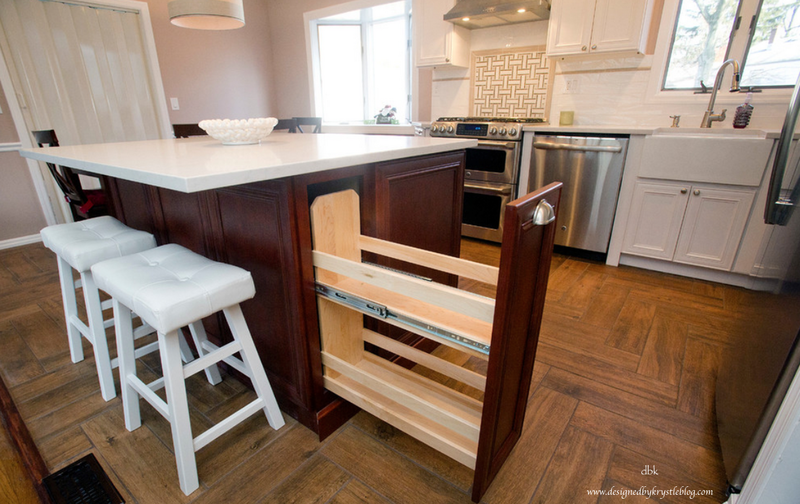 This height makes it easier on our backs as we lean over the sink to brush our teeth, wash our faces, for men shaving, etc., of course if you are short or tall, these can typically be customized at a small increase that will probably be worth it in the long run. For the faucets, think about the way you turn on the faucet and what type of handle is easy for you to grip and use on a regular basis. Lastly, consider adding a make-up counter to give yourself a place to sit down as you fix your hair and make-up. This space can feel very glamorous to the younger crowd, but can become very practical as you age. Don’t forget about good lighting, which will make all the difference in the world as you use the space daily at any age! 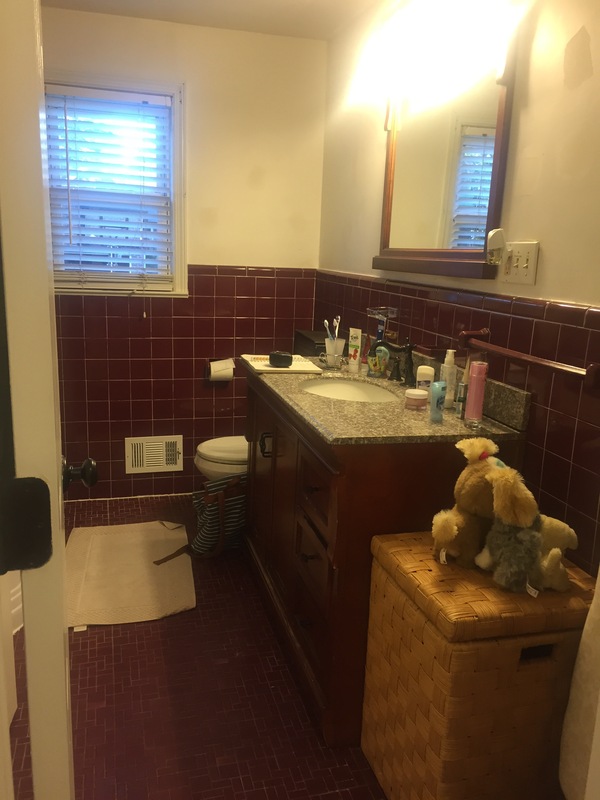 The pictures in this post are for a couple that were renovating their bathroom. They are not old, but they are an older couple and we spent time discussing these things, because as she puts it, she plans to die in this house. We planned a space that takes many of these ideas and makes them a reality. The only thing you don’t see here are grab bars, which we have planned for, purchased and even stabilized the wall in preparation for them, but they don’t need them yet so she wants to wait to install them until the time comes. Their bathroom came together beautifully. The client had been using the bathroom for about 6 months when I came to take these photos and they couldn’t stop raving about how much they really loved it! Have you considered how you will age in your home and what things you could do to make your day to day life a bit easier?